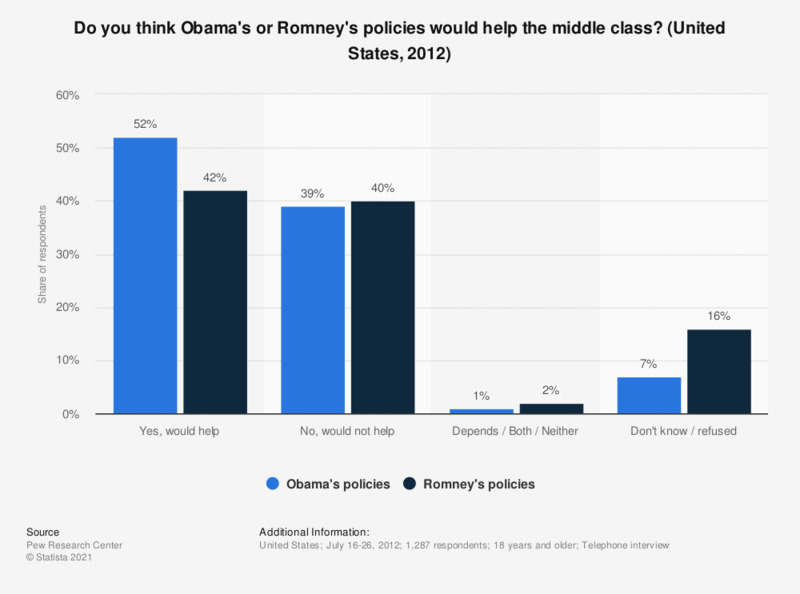 This statistic shows the results of a survey among American adults regarding Barack Obama's and Mitt Romney's policies. The respondents were asked if they consider both candidates' policies helpful for the middle class people in the United States. The survey was conducted in July 2012, shortly before the presidential election. 52 percent of Americans who define themselves as members of the middle class stated they consider Barack Obama's policies helpful to the middle class, while 42 percent thought the same about Mitt Romney's policies. The source asked the respondents if they define themselves as lower, middle and upper class. For details, please see page 123 at the source. Everything On "2012 U.S. election part II voter and candidate" in One Document: Edited and Divided into Handy Chapters. Including Detailed References. Statistics on "2012 U.S. election part II voter and candidate"
Do you approve or disapprove of the way Barack Obama is handling his job as president? Overall, do you have favorable or unfavorable impression of Mitt Romney? Who do you trust to do a better job protecting the middle class - Obama or the Republicans in Congress? Who would you rather was President: Barack Obama or Donald Trump?